Business Website Design For VGA Professional Services, inc.
BsnTech Networks was contacted by Vernita, the owner of VGA Professional Services, Inc., several weeks ago to make an affordable website design for her and her business. Vernita also requested that we make a high-resolution logo design for her as well. Our graphic designer got to work right away on the high-resolution logo design and had it completed within a week. Vernita was exceptionally pleased with the fast turn-around time with our graphic design services. Over a couple of weeks, Vernita then sent us the information she wanted to have on her website. We then put together the information and made a couple of changes and modifications throughout the process. The website for VGA Professional Services, Inc. just was approved by Vernita – and she is very happy that she can go in and manage her own website and make changes to help keep her cost for the website design low. We appreciate the business from Vernita, and she noted that there will be referrals coming our way! 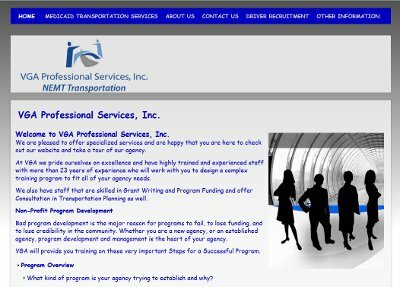 VGA Professional Services, Inc. website is at vgaprotran.com.